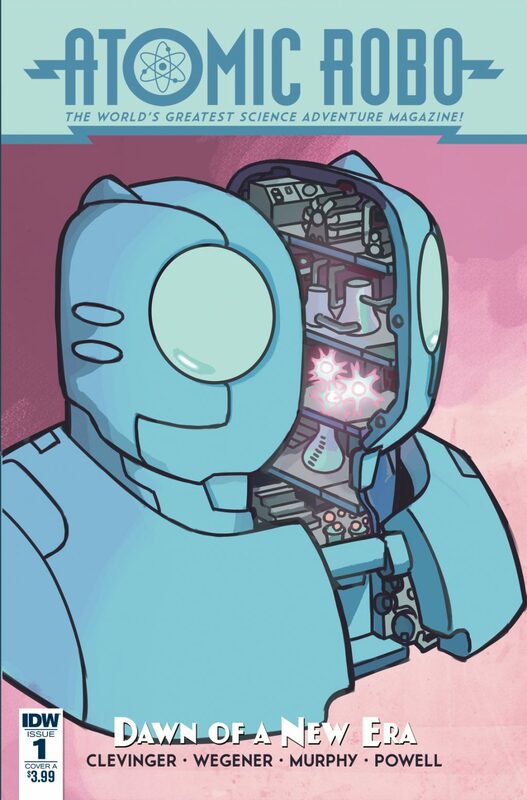 Having been around since 2007, the latest mini-series in the Atomic Robo series is off to a promising start. The series follows protagonist Atomic Robo. He is a robot that possesses “automatic intelligence,” and was created by a fictionalized Nikola Tesla. He is extremely self-aware of the world around him and knows exactly what he is. Throughout his history, he’s destroyed giant ants, took a trip to Mars and has fought Nazis. But now he’s in a new era in his life. He’s the lead teacher/scientist of the Tesladyne Institute, a school for a new generation of action scientists. In this first issue in the new series, we are introduced to a whole new generation of smart minds. Not only are they smart, but very curious as well. They are determined to discover the secrets of the institute, which has been a subject of rumor for a long time. It’s up to Robo and his staff of gifted teachers to keep the students in line and teach them a thing or two about this new world they have entered. Oh yeah, and Robo is also hiding a secret from everyone; an AI son in the basement and new tech he has been working on. Who knows why they are secret, but we will soon find out. Having never read a book in the series before, I was pleasantly surprised at what I found, which is a big heart and a great story. Although he is a robot, Robo feels very human, and the story does a great job at making him feel real. He isn’t a typical AI stereotype, there is more to him than that, and it shows. The human characters also feel so fleshed out. There are quite a few of them, but they all have their depth and personalities. Created by writer Brian Clevinger and artist Scott Wegener, “Atomic Robo & the Dawn of a New Era” is fun. It’s a zany book with excellent writing and beautiful artwork. The colors are bright and pop, and everything else looks great. Overall, it is an excellent SCI-FI book for people looking for something a bit different. If you haven’t read any books in the series, it will get you interested in reading some past issues, which is precisely what I’m going to do.